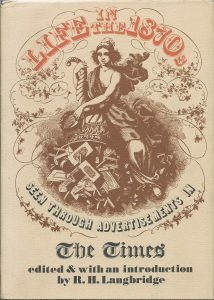 I have a wonderful book of advertisements in ‘The Times’ from the 1870s. As well as being a mine of information about everyday life in London at that date, there is also a section of personal advertisements, many of which could be the basis for a novel. C.C.C.C. Do not despair, my Marguerite. Only have patience. I hope we shall meet on the 3rd at P. Be cautious and attend to all the advice I gave you. Do write to the London address if you possibly can, and tell me what has happened that prevents your writing. If I wrote in l.j. it would betray us. Thine for ever, B.B.B.B. I can’t help feeling that B.B.B.B. is enjoying the drama rather too much to be serious about his attachment to Marguerite. ‘Thine for ever,’ is more than a touch melodramatic. Does B.B.B.B., in fact, have marriage – or a less permanent arrangement – in mind? If I were using this ad as the basis for a novel, I’d throw in some doubts about his true intentions by the end of page 5 at the latest. CAPTAIN CHIOSSO’S LONDON GYMNASIUM and FENCING SCHOOL, 123, Oxford Street, Regent-circus. Open from 9 am to 10 pm. Single lessons and classes every hour of the day. Ladies’ classes for drilling and deportment at 12, on Tuesday, Thursday, and Saturday, superintended by Mme Chiosso. You could have a lot of fun with this scenario. 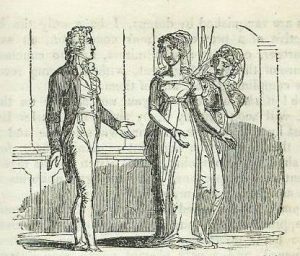 Our hero, Tom, tall, with a mop of curly brown hair, his face flushed from fencing, bounds down the stairs, skids into the ladies’ deportment class and bumps into the heroine, Milly, who is trying to balance a pile of books on her head. Fun, yes, but Tom and Milly need some serious problems if the reader is to be hooked into reading on. Perhaps Milly is being blackmailed by the bitchy Amy about her skipping lessons to meet the attractive Captain Reckless. And maybe Tom’s unpleasant step-father wants him to join the Indian army on the dangerous North-West Frontier. Why? Could he have his eye on the money Tom will inherit when he’s twenty-five? Our heroine, Clémence, is on her uppers and desperate for a job. 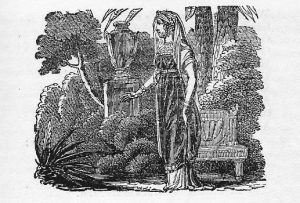 But Mme Fontenelle sounds worryingly creepy. Clémence speaks fluent French but what, exactly, will she be expected to do for the clairvoyant? RESURGAM. – The individual is now in New York. Telegraph immediately to chief of police in that city – C. Nicholls. Devereux Court, Temple. Private Inquiry office. Established 1851. 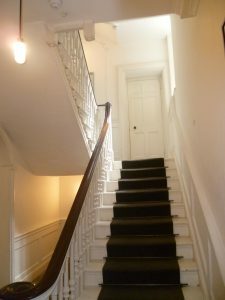 Mr Nicholls’ Temple address – where barristers had their offices, indicates that he is thoroughly respectable, and that, if you are looking for the best, you will be in good hands. Personally, I’m not so sure. Mr Nicholls is not a barrister, he is a private detective, and his address, ‘Devereux Court’ is not in the 1880s A-Z of London. If he were a lawyer, his office would be in one of the Inns of Court: Inner Temple, Middle Temple, Lincoln’s Inn or Gray’s Inn, and it isn’t. We are allowed to ask if ‘Devereux Court’ actually exists. It sounds a bit dodgy to me. ‘Resurgam’ means I will arise. Is Mr Nicholls, as 19th century slang had it – one of the ‘mushroom fraternity’ – i.e. did he spring up overnight? And is he recommended only by himself? There’s a story here somewhere. All these ads need to create a workable plot is to ask a few awkward questions and throw in a serious problem or two to test the hero and/or heroine’s mettle. What fun! Love your plots. Especially the spurious lawyer. Waiting to read that one. Thank you for your comment, Elizabeth. Mr Nicholls really existed – well, sort of. Someone paid for the ad at any rate. It would be interesting to know more about his life and career. Fabulous. Personally I reckon Marguerite has thought better of her one-afternoon-liaison and is now terrified because she sees this as a veiled threat. BBBB really might write in l j (Laura’s Journal? Leicester Journal?) if she doesn’t respond. Well thought of, Jan. I agree. Marguerite might soon be in a very tricky situation indeed! A peek inside the fertile mind of our hostess. How delightful. Quite a party going on in there! How about spinning one of these ads, especially one with doubtful or outrageous claims, off into a Wells or Verne-like story? Speculative Historical Fiction. (shrugs) My take, of course and YMMV. I think ‘Mme Fontenelle’ has potential as a ghost story. Enough of me! These are all great ideas. Bravo! Thank you for your comments, Steve. Personally, I’m intrigued by the fertile imaginations of the interesting people who are reading this post! Come on, people! Someone’s got to pick up one of these brilliant ideas and run with it! Why not you, Prem? You write, I know. Seriously, though, there’s a lot of thinking to be done before writing a single word; getting the characters and background straight in your head, making sure the plot will work etc., not to mention the research, if it is an historical novel. I do fancy Marguerite. I might borrow her – changing the names, of course, so as to protect the innocent. Mind you, she’ll have to wait in line. I’ve got to finish this one first, then write the other two in the quartet. How wonderful, Jan. You wouldn’t even have to change Marguerite’s name, unless you wanted to. I suspect that she is really C.C.C.C. (Caroline/ Charlotte/ Christabel/ Clara? )and that ‘Marguerite’ is B.B.B.B’s chosen name to protect her identity from Mama and Papa. Watch this space (but don’t hold your breath)! It has been my experience that another place to find these small ads is in the endpapers of books of the era (and maybe into the 1930s). Am trying to remember one book in particular… It was Kipling’s sci-fi novel about the Royal Mail crossing the Atlantic in balloons… Here it is: “With the Night Mail: A Story of 2000 A.D. (1905) – “(Together with extracts from the magazine in which it appeared).”” We have a good inter-library loan program here so I was able to get a 1st (or perhaps it was a facsimile). Those ads were interesting, but alas, that was many books ago and I do not recall the details. I think you are right, Steve. I remember seeing a very old paperback published during World War I which had a black and white picture of a British officer, obviously in the trenches, and it was advertising Craven A cigarettes to ‘Steady the Nerves’.